Luton Town sealed promotion to League One on Saturday after a 1-1 draw at Carlisle United thanks to Olly Lee’s second half goal. Here’s how the Hatter rated on the afternoon. James Shea: 7.5 - Tad unlucky to concede the penalty as Bennett appeared to be on his way over before contact was made. Looked assured afterwards though and his swift distribution helped Town get on the front foot in the second half. Jack Stacey: 7.5 - Solid against his former side as he kept threats to a minimum on his flank, not allowing United to create that many clear-cut chances throughout the 90 minutes. Ventured forward more to give Town the width they required as the game wore on. Dan Potts: 7.5 - Another impressive display by Potts who cleared his lines effectively and got away to produce some good crosses on the left. 13th booking of the campaign means he needs to be careful in the final matches as two more will lead to a ban next term. Alan Sheehan (STAR MAN): 8 - Marshalled the back-line excellently as Town made sure they didn’t concede again after the early penalty. Dominated aerially as he has more often than not, while brought the ball out with his usual surety. Glen Rea: 8 - Has been excellent since moving back into the centre of defence and continued with a fine display at Brunton Park. Crucial intervention as just got enough on Campbell-Ryce’s cross to prevent Bennett making it 2-0. 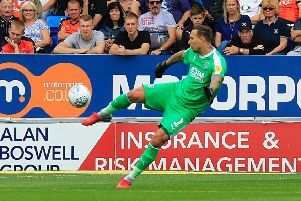 Alan McCormack: 7.5 - Kept up his record of not being beaten since returning from injury and played his part in protecting Luton’s back-line making an excellent clearance at 1-1 to prevent the Cumbrians going back in front. Olly Lee: 7.5 - Was on the verge of being substituted according to boss Nathan Jones just prior to netting undoubtedly the most important goal in his Town career to date, keeping calm to slot home from close range. Pelly-Ruddock Mpanzu: 7.5 - Enjoyed some good moments in the first half as he tried to get Luton going, but more importantly did his defensive duties well as Town stayed in the game. Inches away early after the break and a great chance to win it late on only to be denied by Jack Bonham. Elliot Lee: 8 - Got through plenty of closing down in the first half as Town didn’t see a lot of the ball, but really lively after the break as Luton pressed forward. Led a number of attacks and played his part in the leveller by freeing Hylton. Danny Hylton: 7.5 - Had a right old tussle with imposing defenders Ellis and Hill as he kept the pair busy. Remained admirably cool as the pair tried to get him booked, coming to life in the second period, as it was his shot parried away that led to Lee’s leveller. James Collins: 7.5 - Looked dangerous as Luton came into the proceedings after a disappointing opening 30 minutes, seeing one effort deflected narrowly wide. Never gave the home defence a moments peace in the second period as got through plenty of running, linking up well with both Hylton and Elliot Lee. Johnny Mullins (SUB): 5 - On for a few minutes as Town looked to close out the game. Flynn Downes (SUB): 5 - Same as Mullins, entered the fray in stoppage time.